What types of policy questions are other leaders, policymakers, or practitioners asking? 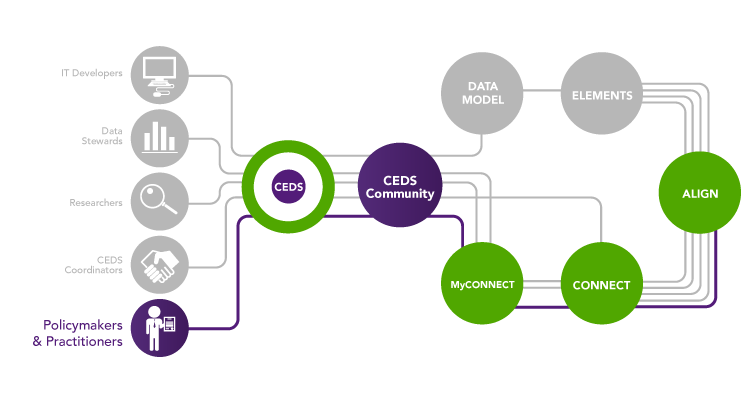 The CEDS tool, Connect, is an avenue for identifying various policy questions that others are asking and provides the CEDS data elements necessary to answer those questions. Connect has over 30 categories, each with its own set of descriptors, to help you find specific Connections of interest. Does my organization collect the data necessary to answer the policy question(s) I’m interested in? The CEDS tool, Align, allows you to build or upload a data dictionary to CEDS as a map. That map can then be used to ascertain whether your data systems collect the information (data) you need to answer that question. Maps that have been shared can then be used in myConnect to compare the data elements you collect with those that are used in Connections that interest you. How can CEDS help mitigate issues with identifying data needed to address the enactment of new policies or laws? Often times, a new policy/law is enacted that requires data to implement. CEDS allows policymakers to ask questions in advance to determine whether the policy or law is implementable right away, or if it will take time, effort, or resources. By creating a Connection you can identify the CEDS elements that would be needed to address the requirements. Then, compare the Connection to your aligned maps using myConnect to determine whether you have the right data. Alternatively, if the data are to be derived from an outside agency, the link to the Connection can be provided to that agency as a way to start a conversation about what is required and whether they collect the data necessary to respond.